This article is a short summary of Mario Kart 8 Deluxe. Mario Kart 8 Deluxe is an enhanced port of the Wii U title Mario Kart 8, released for the Nintendo Switch in April 2017. This version of the game features all of the base and add-on content of Wii U release while adding its own brand new content and changes. with more tracks, modes, and features than ever before! New faces to race with! Duke it out in a new-and-improved battle mode! Smart Steering Now you can play without driving off course! Hold two items at once for double the firepower! 48 tracks of deluxe Mario Kart action! New courses. Fan favorites. Brand new rules. Double items let you dominate the competition! Smart Steering keeps you on track. In addition to new vehicle parts and characters, Mario Kart 8 Deluxe also features two additional items: the returning Boo and, exclusive to battle mode, the Feather from Super Mario Kart. Like in Mario Kart: Double Dash! !, players are now able to carry up to two items at once. A third level of drift boost has been added, indicated by pink sparks. The game also features a new "Smart Steering" function for younger and novice players, allowing players to more easily stay on the track, as well as "Auto-accelerate", which automatically drives the kart forward without needing to push the accelerate button; both of these features can be enabled and disabled at any point during a race from the pause menu, as well as tilt controls and the on-screen map. Unlike in the original game, all of the characters in Mario Kart 8 Deluxe are available from the start; only kart parts are unlockable. Mario Kart 8 Deluxe features a revamped Battle Mode, allowing players to play a variety of modes and battle on a set of eight new and returning battle stadiums. In addition to Balloon Battle in the standard game, Battle Mode features returning game modes such as Coin Runners, Shine Theif, and Bob-omb Blast, and a new game mode titled Renegade Roundup, in which one team must capture every member of the other in order to win. A new time trial mode for 200CC has also been included. Like the original game, Mario Kart 8 Deluxe runs at 60FPS with one or two players and 30FPS with three or four, regardless of whether the system is docked or not. The game renders at 1080p in TV Mode, and at 720p in handheld mode. With the nature of the Nintendo Switch as both a home console and a portable device, director Kosuka Yubaki thought that Mario Kart would be perfect for the device, and because he also wanted to release a Mario Kart game as soon as possible, the team began work on a port of Mario Kart 8. According to Yubaki, the development process was "very smooth". Using the Wii U game as a base allowed the team to better understand the Nintendo Switch hardware by being able to directly compare the capabilities of the two systems. The superior CPU and memory of the Nintendo Switch allowed the developers to implement features such as additional items and allowing every racer to hold two items. Mario Kart 8 Deluxe received critical praise, with review scores generally around the same as if not better than the Wii U release. Many reviewers praised the expanded battle mode, calling the game the definitive version of Mario Kart 8. However, many reviews have been divided on whether or not the game would be appealing to fans who already own the original Wii U title. The game was given a total 35/40 score by Famitsu (9/9/9/8), one point less than their score for Wii U version. 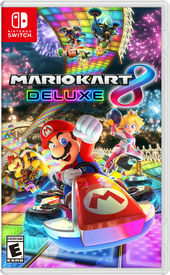 Jose Otero of IGN rated the game a 9.3 out of 10, comparing it favorable to the original by calling it, "a souped-up version of the Wii U’s Mario Kart 8" and praising the amount of content present within the game, but criticizing the lack of changes to the online mode. Chris Carter of Destructoid rated Mario Kart 8 Deluxe a 9.5 out of 10, calling it, "straight-up a better version of the game without compromise." In the United States, Mario Kart 8 Deluxe sold over 459,000 copies (including both physical and digital sales) on launch day, making it the fastest selling Mario Kart game (surpassing Mario Kart Wii). Selling over 550,000 copies (460,000 physical units), Mario Kart 8 Deluxe was also the best-selling game in the month of April. In the UK, Mario Kart 8 Deluxe was the top best-selling game on its first weekend of sales, the first Nintendo-published game to receive the top position since Pokémon White Version in 2011 and the first Mario game since Mario Kart Wii. In Japan, the game sold 280,229 copies during its first week, the best-selling game that week. Finally, Mario Kart 8 Deluxe was the best-selling game for the week of its release in both Australia and New Zealand. 1.1.0 May 17, 2017 Displays opponent names in rear view in online matches, increases invincibility time upon being hit by an item in online matches, allows up to two players to spectate friend matches while waiting to join, decreases the chances of adding players to 200cc or Mirror matches in "Worldwide" and "Regional" online modes, allows players to create friend lobbies when they have 100 or more friends, changes to Inkling Girl's animation, starting positions in online races reflect the order in which players join a room, gives Mii racers facial expressions, adjusts tournament clocks to reflect real-world time. 1.2.0 June 28, 2017 Adds a Pikmin Mii costume unlocked by using Pikmin-based amiibo, displays race rules and course names on loading screens for online, local play, and Mario Kart TV; adjusts item distribution to allow players farther back to more likely receive items to catch up, limits the Piranha Plant to two at a time in online matches, fixes an issue that causes the controls to be unresponsive when the timer runs out in online when choosing a Mii racing suit, leaves items on the track if a Super Horn is used, fixes the item roulette so that it no longer spins continuously in online matches, the Boomerang now returns to the first item slot if possible after being thrown, the items shown in the item slot display correctly when holding an item behind the kart, it is no longer possible to use an item if it is used to block an item, fixes communication error issues. 1.2.1 August 9, 2017 Fixes an issue that prolongs the time to return to the lobby after races near the start and end of tournaments online. 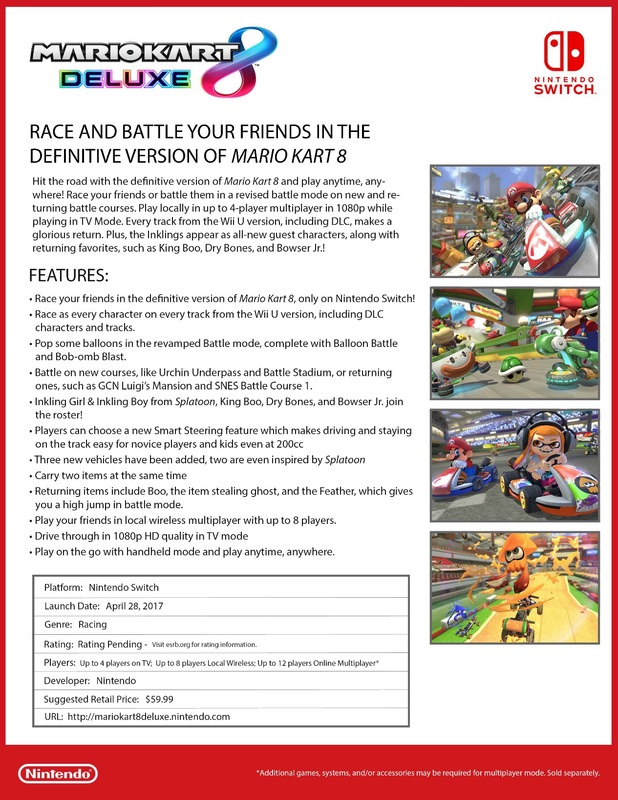 ↑ 1.0 1.1 1.2 1.3 1.4 Mario Kart 8 Deluxe fact sheet. Retrieved from Nintendo Everything on January 13, 2017. ↑ 2.0 2.1 Mario Kart 8 Deluxe - Nintendo Switch Presentation 2017 Trailer. Nintendo (YouTube; January 12, 2017). Retrieved January 12, 2017. ↑ Mario Kart 8 Deluxe on the official Japanese Nintendo website. Retrieved January 13, 2017. ↑ Mario Kart 8 on the official UK Nintendo website. Retrieved January 13, 2017. ↑ 6.0 6.1 Mario Kart 8 Deluxe producer on bringing the racer to Switch, new additions and improvements. Nintendo Everything (February 8, 2017). Retrieved April 16, 2017. ↑ 7.0 7.1 New Mario Kart 8 Deluxe gameplay. NeoGAF (April 10, 2017). Retrieved April 10, 2017. ↑ Watch Mario Kart 8 Deluxe Play By Itself! (Self Driving Car!) GameXplain (YouTube; April 18, 2017). Retrieved April 19, 2017. ↑ Mario Kart 8 Deluxe - New Pink Sparks, 200cc Trial Mode, & All Characters Unlocked!. GameXplain (YouTube; April 10, 2017). Retrieved April 10, 2017. ↑ 10.0 10.1 Mario Kart 8 Deluxe - Overview trailer (Nintendo Switch). Nintendo UK (YouTube; March 10, 2017). Retrieved March 10, 2017. ↑ Mario Kart 8 Deluxe always runs at 60 FPS with 1-2 players, 30 FPS with 3-4 players. Nintendo Everything (January 13, 2017). Retrieved January 13, 2017. ↑ Nintendo Switchにぴったり！　『スプラトゥーン』キャラ＆コースも入った全部入り、『マリオカート8 デラックス』開発者インタビュー【Nintendo Switchインタビュー特集】. Famitsu (February 9, 2017). Retrieved April 16, 2017. ↑ 13.0 13.1 Famitsu review scores (4/18/17). Nintendo Everything (April 18, 2017). Retrieved April 18, 2017. ↑ NoA PR - Mario Kart 8 Deluxe for Nintendo Switch is the Fastest-Selling Mario Kart Game in Franchise History. GoNintendo (May 1, 2017). Retrieved May 1, 2017. ↑ Nintendo on Facebook (May 1, 2017). Retrieved May 1, 2017. ↑ Nintendo News: Nintendo Switch Was the Best-Selling Video Game System in April; Mario Kart 8 Deluxe the No. 1 Game. Business Wire (May 17, 2017). Retrieved May 17, 2017. ↑ Mario Kart 8 Deluxe is Nintendo's first UK No.1 since 2011. GamesIndustry.biz (April 30, 2017). Retrieved April 30, 2017. ↑ Media Create Sales: Week 17, 2017 (Apr 24 - Apr 30). NeoGAF (May 3, 2017). Retrieved May 3, 2017. ↑ Top 10 games charts for the week ended 30 April 2017. IGEA (May 4, 2017). Retrieved May 4, 2017. ↑ Mario Kart 8 Deluxe Version 1.1 Is Now Available for Download. Nintendo Life (May 17, 2017). Retrieved May 17, 2017. ↑ Mario Kart 8 Deluxe - Version 1.2.1 available. GoNintendo (August 9, 2017). Retrieved August 9, 2017.